After meeting with French president in Paris, Netanyahu told reporters that he opposed the ceasefire agreement between two “friends of Israel”; Russian president Vladimir Putin and US president Donald Trump because it perpetuates the Iranian presence in the country. On July 16, Israeli newspaper Ha’aretz reported that the Zionist regime believes that Iran is planning to build air-force and navy bases in Syria to protect its two Arab allies, Assad regime and Lebanese Hizbullah. Netanyahu has been demanding regime changes in Iran and Syria for decades but now, the Jewish lobby groups are demanding a regime change in Russia too. The process of regime change in Russia began not over Putin’s alliance with Assad or Iranian government but to install a Zionist Jew government in Ukraine. 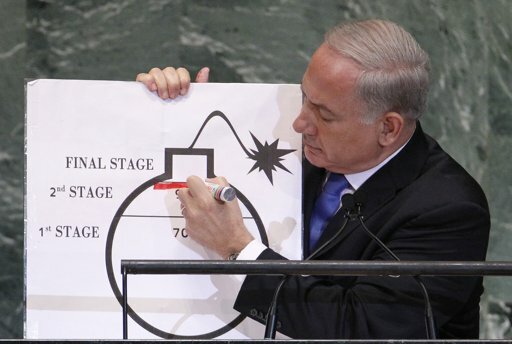 On May 18, 2017, American Jewish writer, author and radio talk host, Stephen Lendman, said that Israeli prime minister Benjamin Netanyahu doesn’t want Syrian bloodshed to end until an anti-Iran regime is installed in Damascus – as war on Assad is really war on Iran and its Arab ally Hizbullah. Christian activist and writer, Preston James, PhD, claims that Israel is the military arm of the Khazarian Mafia (Organized Jewry) which is terrorizing not only Syrian but also United States – and pulling false flag operations around the world to demonize Muslims and Islam (listen below). This entry was posted in World News and tagged Jewish power. Bookmark the permalink.